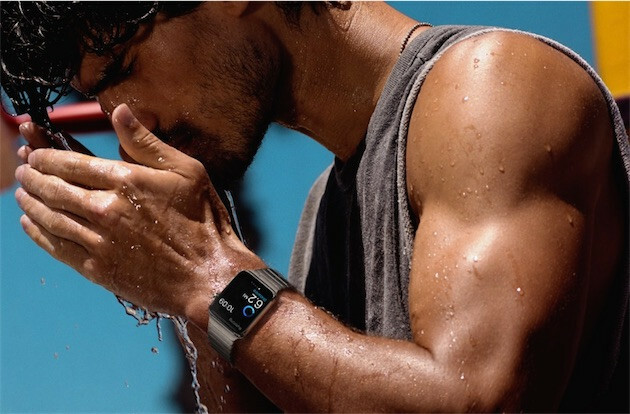 Up until now there’s been no mention of water resistance from Apple, save for the promotional image you can see above. It also implies that the Watch will be splashproof, but maybe nothing more. On the same occasion, Tim Cook pretty much confirmed that we shouldn’t expect more than one-day battery life from the upcoming gadget, saying that he only takes it down in order to charge it – but he does so every night. And once again, Cook reminded everyone that the Apple Watch will be launching in April. In the coming months, we should expect to see more accessibility features on the watch. Cook has praised the comfort of getting notifications on your wrist, especially important ones. He also talked about the Apple Watch serving as your room key in major hotels in the future. As for the launch of Apple Pay in Europe, the CEO did not give an exact timeline, but mentioned that it will happen by the end of this year at the latest.